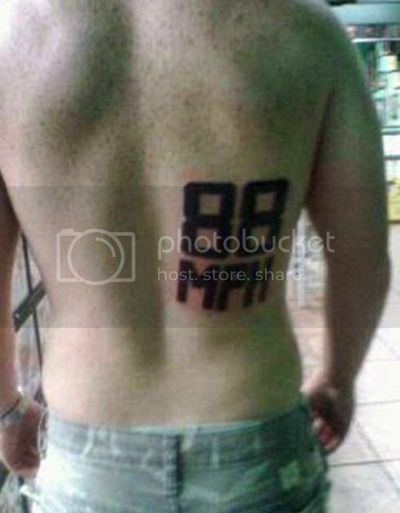 Well, I presume this “88 MPH” tattoo means that this gentleman is a fan of Back to the Future. But of course I imagine it could also be the speed his daddy was going when he hit the wall at Daytona. From what I’ve heard, rednecks like to memorialize these things with tattoos. And beer. Lots of beer. Via Whitney Matheson, who doesn’t think it’s cool to generalize about NASCAR fans. Unless we’re making jokes about illiteracy. In which case, it’s all good. YEAH I like NASCAR because I’m poor and stupid! Exactly, Cartman! Now you’re getting it.